New for 2016, Matakki Gem left handed scissors are a must for your collection. Handmade from the finest Japanese Hitachi steel, beautifully balanced, super smooth and incredibly sharp. 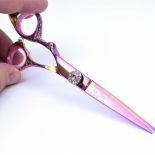 Who said scissors have to be boring? 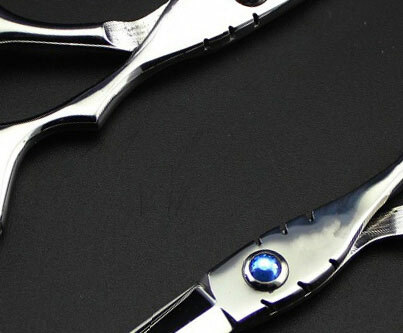 Matakki offer you designer scissors that are practical, perfectly designed and manufactured to perform a lifetime! 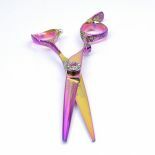 This scissor is also available as a matching set, come take a look at the Matakki Gem Lefty Set and save a further 20%. Includes luxury scissor case, Matakki M3 Hair Texture razor, MT05c Carbon Cutting Comb, scissor oil, cleaning cloth, tension key and maintenance guide. 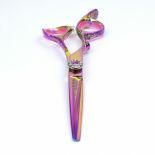 Only available in size 5.5"